Eliciting subject knowledge and ideas... Eliciting is a technique we can use to get learners thinking and saying what they know about a subject. 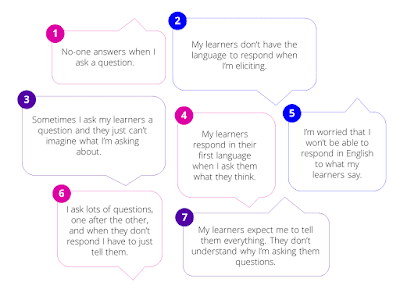 It’s when we ask questions or give learners clues to get learners to say what they know about a subject rather than the teacher giving the explanation. -Okay, tell me six words we can use to describe different forces. -Do you think that conditions are harder for people living in hot deserts or people living in cold deserts? - Write down as many facts as you can about water. However, eliciting can sometimes be difficult for teachers and learners. Communicative Language Teaching (CLT) is a latest and best approach for English Language Teaching. If we ask teachers what kind of teachers they are, nearly all of them will say they are communicative teachers but, unfortunately most of the language teachers don't have any idea about CLT. The video below is between Jeremy Harmer and Scott Thornbury, who are the piooners of CLT. They interview each other and adress some questions about CLT. Raz-Kids is a website that includes hundreds of leveled ebooks with e-quizzes. . Students have to listen to the books first, then read them and lastly record their voices. Online Records let teachers digitally assess each student, saving valuable classroom time. All books are available 24/7 via the Web. Students can practice reading anytime, anywhere. Teachers can make assignments and track student progress with online assessments and student recordings. Viewing reports is simple, for individuals, classrooms, schools and even districts! In my school, we have subscriptions for each of the students. Every week Ss read one book at home and one book in the class. Ss improved their reading and vocabulary a lot via that website. I highly suggest you to use raz-kids. The only problem is that it is not free but, the fee is affordable. It is worth it. This app lets you create amazing classroom communities with students and parents. Teachers can communicate with parents and students privately- no need to exchange phone numbers. You can give feedback to students for any skill like "Working Hard" and "Being Respectful". Students also can share their works. Teachers can get parents involved by sharing photos and videos of wonderful classroom moments. I personally as a teacher use this app and I saw that everything gets easier. Parents and students can check everything about the lessons. For a couple of years, especially with increasing level of educational technologies, teachers, schools and students started benefiting from technologies in the education. In the past we're given worksheets to practice language. I remember my room when I was at the high school. There were so many papers all over the room. It was a pity that we're expected to practice the language on papers. It was taking hours to finish all those rubbish, boring assignments. But now, the technology offers us so many different opportunities to use the language. Students can make video and voice recordings and prepare digital posters or books. Also, students enjoy doing home works by using technology. In my classroom, my students started using blogs. Every week, they have projects, posters or video assignments. They publish their assignments in their blogs and I check them weekly. They are more careful in the home works because their websites can be seen not only by their teachers but also all over the world. Examples from my students' blogs " http://ranatezcan2005.blogspot.com.tr/" "http://seozer35.blogspot.com.tr/"
I think teachers should use a checklist to see students behaviours, notes, attitudes etc. weekly. The one I shared with you is my checklist. Every week I fill the checklist according to my criterias. One can follow students' progress with this checklist also Ts can show this to parents in the P.meeting, which will be easier to explain them students' performance in the classroom.